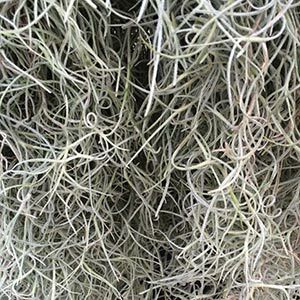 Mostly its known as Spanish Moss, call it what you will, the botanical name is Tillansia usneoides and it is an ‘Air Plant’. It lives on air, the moisture and the nutrients it can extract from air keep it alive. With one of the common names being ‘Spanish Moss’ this plant is not in fact a moss, in fact its not really one plant at all, its actually thousands of small plants that grow together in strings. It is found widely in the south eastern areas of the USA and grows as far south as Argentina. It is not rare, however it is amazing. The silvery strings of foliage will also flower, small green flowers in summer followed by seed pods. However it is the foliage that it is grown for. This is an air plant, it does not produce roots and can simply be hung over a tree branch, and i the right conditions it will thrive. It does not like the combination of heat and dryness, the warmer the climate the more moisture it needs. So for good growth try warmth and humidity. Spanish Moss also likes shade, it naturally grows hanging from trees in filtered light, so you need to mimic these conditions. It will grow in full sun, however needs humidity to survive in these conditions. Watering – Spray with a misting spray every second day in summer. In very warm periods, spray every day. In winter spray once very week or two. Fertiliser – Having said that the plants lives on air, we do suggest the occasional spray with a diluted seaweed fertiliser, it will speed up growth. How big will Tillansia usneoides get ? It can reach 30m in length, not likely in cultivation, however we have seen many plants that are 5m plus in length.